This August, Grammy Award-Winning singer/ songwriter Jason Mraz is taking fans nationwide on a creative journey that follows the making of his sixth studio album Know. with an exclusive nationwide cinematic event, “Jason Mraz – Have It All The Movie.” In partnership with Atlantic Records, the docu-style – directed by Emmy® Award-winning director Martin Montgomery – includes never-before-seen footage plus a special performance from The Mranch, where Mraz and his Superband perform new material from his forthcoming album. It will premiere as a one-night event on Tuesday, August 7. 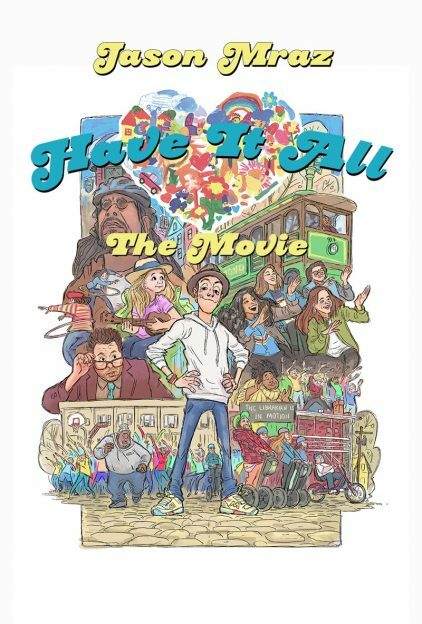 Tickets for “Jason Mraz – Have It All The Movie” can be purchased beginning Friday, June 29 at www.FathomEvents.com and participating theater box offices. Online and mobile ticket purchasers will be eligible to download a digital copy of Mraz’s new album Know. on Friday, August 10 following the event, making this the ultimate fan experience. Details can be found on the Fathom Events website. Fathom Events and Atlantic Records present “Jason Mraz – Have It All The Movie” in select movie theaters nationwide on Tuesday, August 7 at 7:00 p.m. local time, throughFathom’s Digital Broadcast Network (DBN). A complete list of theater locations will be available June 29 on the Fathom Events website (theaters and participants are subject to change). In a family film about joy, success and artistic collaboration, Grammy Award-winning singer/songwriter Jason Mraz takes us on a creative journey that features music from his sixth studio album Know. along with the crazy cast of characters who make up the Mraz Posse. Directed by Darren Doane, this one-night, family-fun event is intended to open the heart, encourage the imagination and celebrate the joys and benefits of the creative arts. Know. arrives at retailers and streaming services worldwide on Friday, August 10.